Feeling Overwhelmed? Just pick one. I've mentioned this with my own word of the year, healthy, but a big way to set yourself up for failure is to have too many goals going at once. That's how I've failed before at health goals, I try to start everything at once (eat healthy, workout, floss daily, etc.) and just get so overwhelmed that I quit everything. This year, I'm only tackling one thing per month. If you're the same, pick just one goal at a time and work on that until you're comfortable with it, and then move on to the next thing. This also helps you recognize if your goals are changing over time. If your focus is pulled in so many directions, you might miss the signs telling you that one particular goal isn't important anymore. Rather than change it and grow in a different area instead, you'll just consider yourself a failure and quit everything. Started Too Big? Make it easier so you can't make excuses. This is similar to setting too many goals at once in terms of that overwhelm feeling, but rather than setting too many, it's that you set the goal too big. While that works in terms of where you'd like to end up, it's hard to start there and be successful. You'll need to take smaller baby steps first. For example, running a marathon. You can't start out running 10 miles a day if you currently don't even do one. Not only will you burn out and quit altogether, you'll also hurt yourself. It's the same as if you set a goal to declutter your entire house. You can definitely get there by the end of the year, but if you try to cram it into a single weekend, you'll get so frustrated with the process that you'll never actually finish. So break these huge goals into smaller, manageable chunks. Concentrate on running one mile a day and work your way up, or declutter just one room or area of a room each week, until you hit that big goal later in the year. Only Seeking Results? Focus on the journey and the routine. A big one with this is health and weight loss, and you cannot focus only on the results on the scale and in the mirror. Those changes take time (as it would with seeing progress in decluttering your house - these common failures apply to all goals!) You didn't gain weight or clutter overnight and it's not going to disappear that quickly either. Focus on how you're changing your daily routine for the better and celebrate smaller victories. The end result will come later, so don't get so discouraged in the meantime that you end up quitting. Still Struggling? Change your surroundings. One of my goals this year is to stop ordering in food so often. That doesn't just happen, though, it's not as easy as saying 'okay, I'm not logging on to GrubHub anymore.' What would I eat? I had to change my surroundings. I have to grocery shop and keep the fridge stocked, and I need to have some go to easy things on hand like frozen pizza and canned soup for those days when I just don't have it in me to cook. I also need to stock things like snacks, drinks, and desserts so there's no excuses as to why I'd need to order in. If you find yourself struggling with your goal, try thinking about what you need to change in your immediate environment to help yourself make that goal happen. Workout more? Get running shoes that don't hurt your knees and keep hand weights next to the TV. Don't keep things the same as you always have and expect results. You have to be willing to change. So don't quit just because what you said on January 1st isn't working out for you at the moment. Reassess and start over today or on February 1. You still have 11 months of 2018 left, and it's amazing how much can be accomplished in that time. 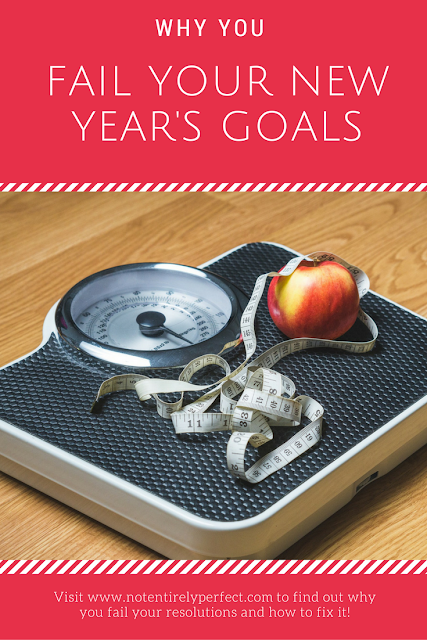 How are you doing on your goals for this year or this month? Anything you need to change going forward?